With rain falling at the moment and temperatures forecast to fall into the 30s, Max and Sierra are wearing their cold weather attire, handmade by Abby. Ordinarily, despite all good intentions, holiday meals get quickly out of control. If there are eight people involved, for example, there are essentially eight different holiday meals to be prepared, followed by more leftovers to stash and more dishes to rinse than anyone imagined at the start of the day. Many of these holidays have, for me, devolved into grueling chores. I do not often look forward to them. 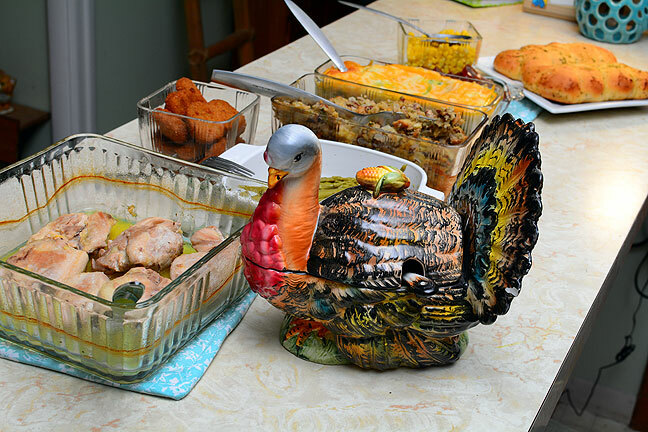 Today, though, due largely to my own flexibility about the meal, my wife Abby and I had a relaxed, intimate Thanksgiving dinner, just the two of us, and afterwards, due to my planning and efforts to stay ahead of the kitchen chores, putting away leftovers and getting dishes in the dishwasher took less than ten minutes. We have lots of pie (sweet potato, pecan, Dutch apple, and four-berry), but we both think of is as a “long weekend” dessert. This is our modest buffet for today’s enjoyable Thanksgiving meal.